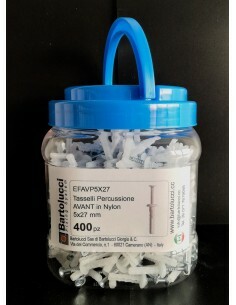 > Box 200 Nylon Hammer Plugs EFAV6x37 mushroom head "AVANT"
Box 200 Nylon Hammer Plugs EFAV6x37 mushroom head "AVANT"
Generalities: The hammer plug of AVANT series is quickly installed and the ratio quality-price is good. 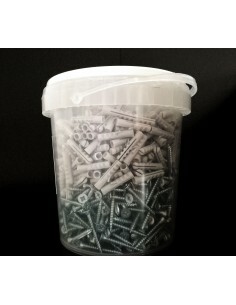 The quality of the materials involved in the process, PA6 nylon plastic and zinc-plated nails, make it reliable over time even in adverse environmental conditions. Benefits: Made in Nylon so as to be used at temperatures of the range -40° C up to +80° C Zinc-plated nail resistant to oxidation and to environmental agents Hammer plug provided with preassembled nail, quick to use by a simple hammer blow. Applications: Suitable for Concrete, Stone, solid Bricks. Able to fix metal profiles for plasterboards, wooden and metal substructures, panels and light plates.